I wanted to answer a Fix My Back Pain customer question. Why is stretching your calf important for back pain? There are two reasons why. Most of the times when we talk about muscles, we talk about them in isolation. The calf muscle, the quad, biceps, etc., but in reality all the muscles are hooked up together, especially the muscles in the back. The muscles connect all the way from the foot, the arch, the calf, the hamstring, the glutes, the piriformis and all the thoracis extensors. All those muscles are weaved and connected together and when you get back pain, the protective mechanism that happens is everything tightens up in order to protect that back and in order to prevent further damage occurring to the back, so what we want to do is to decrease that tension in that back or in those muscles in order to decrease how much tension those muscles are causing on the back, we want to work on stretching all of these muscles and that’s why it is important when it comes to back pain. When back pain hits, a lot of times it’s difficult to target the back, right away. 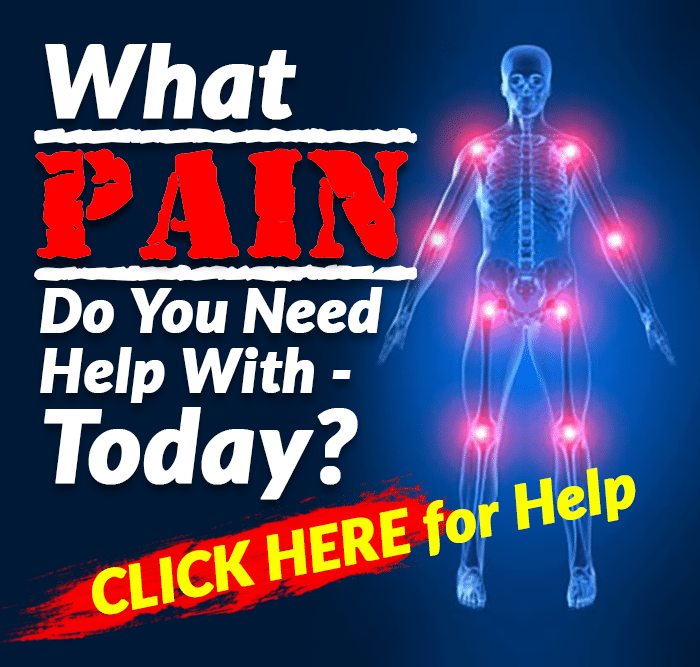 What we can do is we can start working around the back and if we can do things to help around the back that will decrease the pain when it comes to the back. There you go, those are the two reasons why we want to focus in on the calf. The calf is part of the muscles in the back that all are connected and those connected muscles are putting excess stress on the back. What we want to do is to lengthen and stretch out those muscles in order to decrease the stress on the back. The second reason why, is sometimes it’s difficult to attack a lower back pain right away and we can be working around the lower back pain.. I will give you two exercises that I recommend when it comes to stretching out the calf . I got my trusty chair here and I’m going to have a seat. 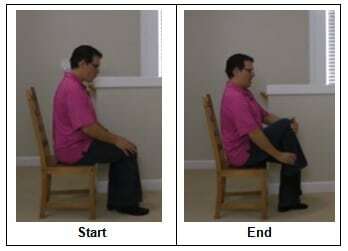 I’m sitting nice and upright because usually being vertical is easier on the back. I’m going to pull the knee up and what I’m going to do is self massage that calf area. Key things to remember is that foot is relaxed and the toes ate pointed, which decreases the stretch in the calf so I can self massage it better. What I am doing is pressing the muscle, rubbing the muscle up and down, rubbing the muscles side to side or doing circles. Trying to relax that muscle rubbing that muscle improves circulation in that muscle and breaks up tension in that muscle. And I’m looking at going ten times throughout that muscle. It can take 15-30 seconds to do. After I self massage that muscle, I will be moving in to a calf stretch. Utilizing the wall, feet start together and then I’m going to take a big step back, all toes are pointing straight ahead and feet are flat. Weight on the back of the heels of back leg and then I’m going to lean forward looking at getting a light stretch in that calf area and then relax it. How long I’m looking at stretching forward is about 20 seconds, and 20 seconds on each side. There you go, that answers that question, you know why stretching your calf is so important when it relates to back pain. Now you know, make sure to give those two exercises a go and that’s about it. 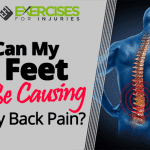 Can My Feet Be Causing My Back Pain?